View the mpeg movies below to get an idea of how your art will look while you are playing the Kaleidica. (Your browser should already have an mpeg player built in... if not then go to the browser home page and download one.) The main difference between these movies and actually playing the Kaleidica is that when you use the Kaleidica the action will fill your entire screen at full resolution. 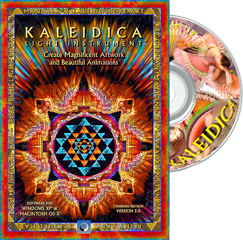 The Mandala Edition allows you to make full screen animations and play them back using the Kaleidica scripting format. NOTE: To make QuickTime, AVI, DVD and other fomat recordings (like those below) you will need the Professional Version of Kaleidica. Twenty Four fold symmetry using the Kaleido Studio and the Bonfire animated Brush. Seven fold symmetry using the Circle Studio and the Whorling Tetrahedron animated Brush. Eight-way Mirror Studio animation using one of the Blake More animate brushes (dancerOnBack) that are included with the Standard Version of the Kaleidica. This animated sequence is made with an image of a Joshua Tree taken in the Mojave Desert. The Studio is Kaleido set to nine fold symmetry. Made with the Mirror Studio and one of Blake More's dancer brushes (dancer with scarf). The KALEIDICA, The KALEIDICA Light Performance Instrument, and Fishrock Studios are trademarks of Fishrock Studios. Copyright © 2000-2013 by Fishrock Studios, All Rights Reserved.